Reopening investigations into the 2016 election would thrill liberal voters but could involve political risk, and showdowns with key Trump associates. House Democrats stuck in the minority have spent months demanding more answers about Trump campaign contacts with Russians in the 2016 election, only to find themselves stymied by a lack of investigative power. House Republicans ignored dozens of those Democratic requests for witness testimony, emails, documents and other evidence before shutting down the Intelligence Committee’s Russia investigation altogether. But the tables could soon turn. Democrats appear poised to make major gains in the November midterm elections, with forecasters calling a House Democratic majority likely. That outcome would allow Democrats to re-open the House’s Russia probe and work through a checklist of witnesses and subpoenas Republicans refused to grant them. Several lawmakers in line to take powerful committee posts have prepared lists of people to summon for what could be the House’s first public hearings on the subject. The House Intelligence Committee quizzed several associates of President Donald Trump about alleged collusion with the Kremlin, but only behind closed doors. 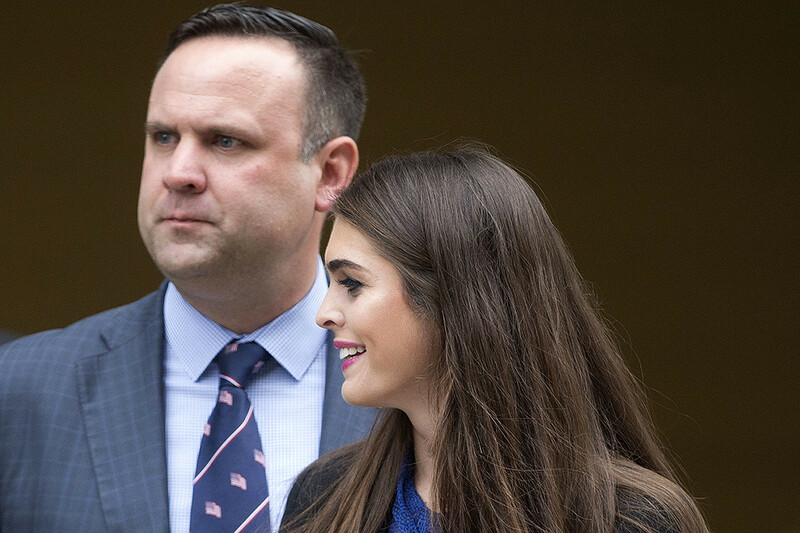 Those likely to be hauled over to Capitol Hill include close Trump associates like the president’s son, Donald Trump Jr., former White House communications director Hope Hicks and the current White House social media director, Dan Scavino. Trump Jr. and Hicks have appeared before the House intelligence panel but, Democrats complain, gave incomplete answers in their testimony. Such an approach comes with political risk. Republicans already accuse Democrats of being obsessed with Russia, to the exclusion of kitchen-table issues, and they say the investigative zeal is merely a prelude to an inevitable impeachment push. The top Democrat on the Senate Intelligence Committee even fretted earlier this year that Americans might soon grow “tired” of such probes. And some Trump associates may be prepared to fight back. “Contempt of Congress? I don’t really care,” said Sam Nunberg, a former Trump 2016 campaign adviser, one of more than 65 people identified earlier this year by the Democratic leaders of the House Intelligence and Senate Judiciary committees as someone who had information that Republicans refused to pursue. Trump Jr., Hicks and former White House strategist Steve Bannon all declined to answer questions during the Republican-led Russia investigations by citing executive branch privileges that Democrats called dubious, and they could adopt the same position come 2019 — daring Democrats to escalate the standoff. Democrats will also need to be careful about stepping on the toes of special counsel Robert Mueller, whose own Russia probe appears likely to spill into next year. “They’d come in for immense criticism if they come in like the bull in the china shop and create more problems for Mueller,” said Douglas Letter, a recently retired senior Justice Department attorney who teaches at the Georgetown University Law Center. Democratic Rep. Adam Schiff, who would chair the House Intelligence Committee, said he’s looking forward to a productive relationship if Democrats capture the majority between the panel under his leadership and the special counsel’s office. “It would certainly be a more cooperative relationship, and we would want to have the special counsel aware if witnesses are committing perjury or if witnesses are providing information that would be relevant to their investigation,” he said. The Democrats’ ready-made roadmaps cover a number of other Russia-related topics too. Rep. Jerrold Nadler, who is in line to chair the House Judiciary Committee, has been demanding hearings on Trump’s repeated disparagement of the FBI, as well as immediate action on a bill that would prevent Trump from unilaterally firing Mueller. The New York Democrat also wants briefings from the Justice Department on the prosecution of Trump’s personal lawyer, Michael Cohen. At the House Oversight Committee, Rep. Elijah Cummings has sought testimony from Trump’s intelligence chief, Dan Coats, after Coats warned of the urgent threat of Russian interference in the 2018 election and beyond. The Maryland Democrat has also asked for subpoenas for information connected to the Russia probe: including for testimony from Bannon, documents about former Trump national security adviser Michael Flynn’s foreign contacts and details about Republican data firms and any foreign payments received by the Trump Organization. A driving factor for Democrats as they prepare for majority status is a concern that Mueller’s investigation might not produce a public report anytime soon that helps clarify what happened in 2016 when Trump upset Hillary Clinton. Several Democrats said they are interested in reviving the idea of an independent commission to investigate 2016 Russian election meddling. They stressed that their interest is not simply the question of alleged collusion between Trump associates and Russia. One party leadership aide said a wider agenda would include protection against future cyberattacks on voting systems and infrastructure. California Sen. Dianne Feinstein, who is in line to become chair of the Judiciary Committee, has her own list of more than 40 people, as well as companies like Facebook and Twitter, who have not responded to her own office’s information requests related to the Russia investigation. Her office declined comment on any specific oversight plans should Democrats win the Senate majority. “Too hypothetical for us to engage in now,” said a spokesman for the lawmaker. On the Senate Intelligence Committee, ranking member Sen. Mark Warner earlier this month told CBS News that his panel’s bipartisan investigation on the Russia front would be “hard pressed” to finish its final report on collusion before the November midterms. Warner also said he remains interested in obtaining more interviews, beyond the 100-plus that his committee has already conducted. He singled out both Cohen and former Trump foreign policy adviser George Papadopoulos, whose contacts with Russians triggered the FBI’s initial investigation into the Trump campaign. Warner also has suggested that Americans might be growing fatigued by the Russia investigations. Republicans and Trump allies, meanwhile, vow not to roll over for newly empowered Democrats. “I’d think if my answers to the special counsel were sufficient, then there really is no need for me to testify before Congress,” said Mark Corallo, a former spokesman for Trump’s legal team who has been identified by Schiff and Feinstein as a witness they’d like to question. Michael Caputo, a former Trump senior campaign adviser who has already voluntarily sat for interviews with the House and Senate Intelligence committees, said he would be reluctant to return to Capitol Hill for more testimony. Congressional Democrats are sure to face pressure from party activists clamoring for more answers, as well as a 2020 presidential field looking to please core Democratic voters, many of whom are convinced huge amounts of 2016 wrongdoing remains unknown to the public. “Looking forward to this true Patriot @tedlieu getting subpoena power in January!” tweeted Michael Avenatti, the lawyer for adult film actress Stormy Daniels, citing the Twitter handle of Rep. Ted Lieu (D-Calif.), a member of the House Judiciary Committee.